After the death of vocalist Layne Staley and the passing of 14 years, I never expected to hear a new Alice In Chains album. When I heard that there was one, I really never expected it to be this good. But Black Gives Way to Blue is every bit the sludge metal masterpiece that Dirt, the group’s previous high water mark, was. Like AC/DC with Back In Black, this album takes tragedy and turns it into amazing music. 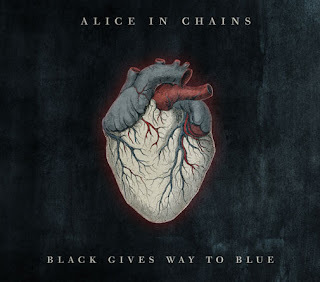 New co-vocalist/guitarist William DuVall may not be a dead ringer for Staley, but he has a strong voice of his own, and when it blends with guitarist Jerry Cantrell’s voice, the resulting harmonies are unmistakably Alice In Chains. The album opens with “All Secrets Known”, a powerful declaration of rebirth that addresses the trials the band has been through while looking to the future. “Check My Brain” hits hard with an ugly but catchy riff and darkly melodic chorus, while “Your Decision” shows the band’s equally compelling acoustic side with Cantrell taking the lead vocal. In an album full of great songs, the stand-out track is the seven minute epic dirge “A Looking In View”, which effortlessly shows what inferior imitations bands like Godsmack are. It’s nice to have the real thing back. If you’re still skeptical, check out the video for “A Looking In View” on Youtube. Embedding was disabled, so you'll just have to click through to the page. Sounds great! I've been really skeptical about all the praise this album's been getting but I guess I'm gonna have to start believing it. Great review! I was having doubts about this album at first, but the more reviews I read, the more I need to stop talking about it and finally purchase this CD! So I had a chance to listen to this one several times now. I must say it grows upon me with every listen (lke usual). I would say this one is an acquired taste. It has some of the old classic AIC formula, but when the new singer opens his lungs you can definitely tell it is grunge but not Layne. Cantrell keeps the sound strong securing the roots of AIC. If it was not for Jerry, I think this album would have fell apart. My highlights are tracks #2, 9 (for some reason I just like it) and 10. There's a really cool driving guitar riff in #6 too which is definitely noticeable and a tempo changer! Overall, I am satisfied with my purchase. I just wished I could have got a better price on it.